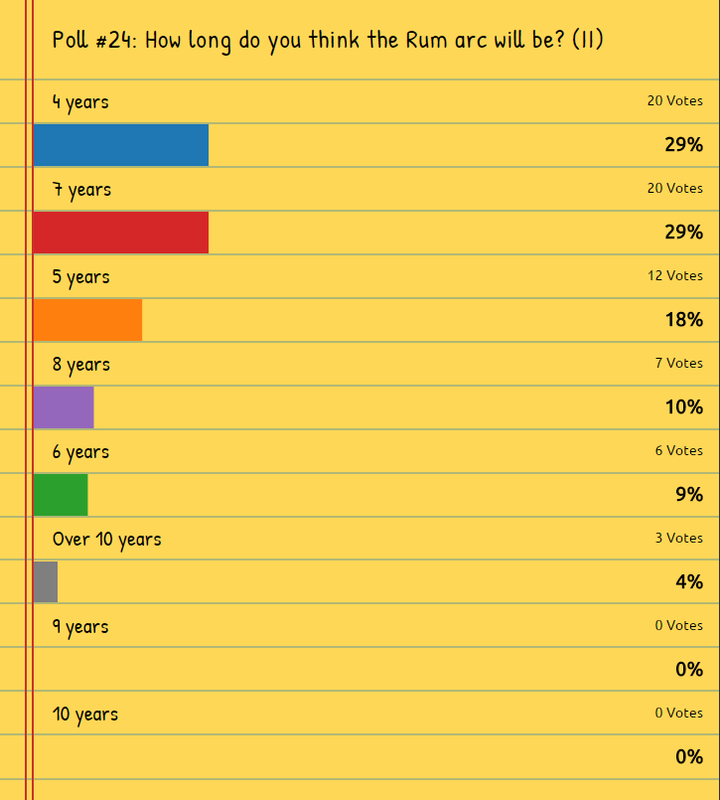 Welcome to the Mystery Poll! 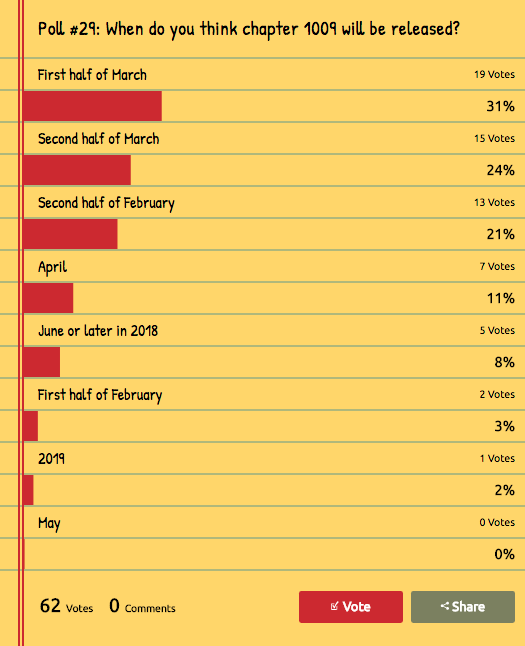 Whenever there's a break in the publication of the manga, there will be a new week-long poll regarding one of the ongoing mysteries in the series. By the end of the week, we'd be able to see what most of the community think is the truth behind the mystery. After the week's over, I'll put the results in the first post (and a new poll will be added in case the break is longer than just one week). Feel free to post what you voted and explain why you voted for it. You're also welcome to suggest what mystery the next poll should be about. Who is Masumi's 2nd brother? Who is the Unknown Child? Which of these characters do you think has some sort of British connections/relations? What's your speculation regarding Kuroda? 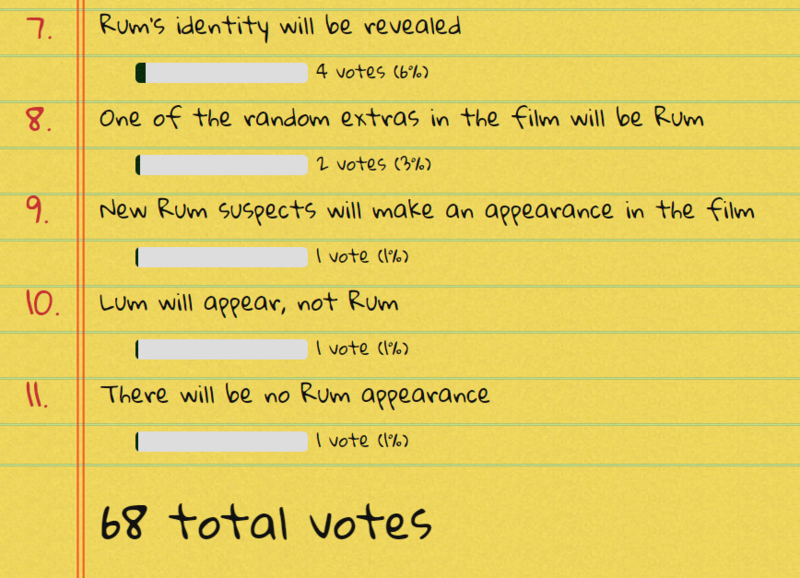 What is/are your speculation/s regarding Rum's identity? Which characters do you think will die by the end? What do you think is the true purpose behind APTX 4869? 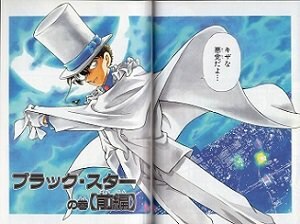 Which one of the current ongoing mysteries do you think Gosho will resolve first? What's your speculation regarding the general history of Amuro/Bourbon? 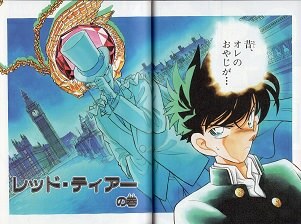 Who do you think are the two mothers that according to Gosho, will be revealed to be sisters? Who do you think will be the next character to discover Conan's true identity? What do you think is the secret connection between Vermouth and the Boss? What do you think is Rum's main objective? What do you think happened with Scotch? Which characters do you think will also get a romance story? 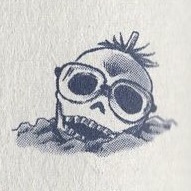 How long do you think the Rum arc will be? 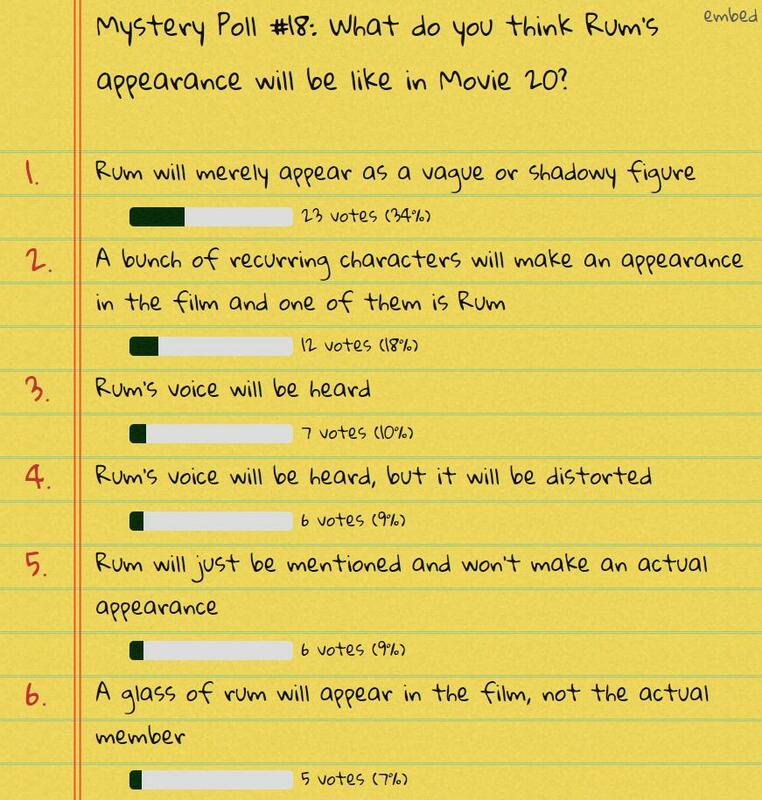 What do you think Rum's appearance will be like in Movie 20? 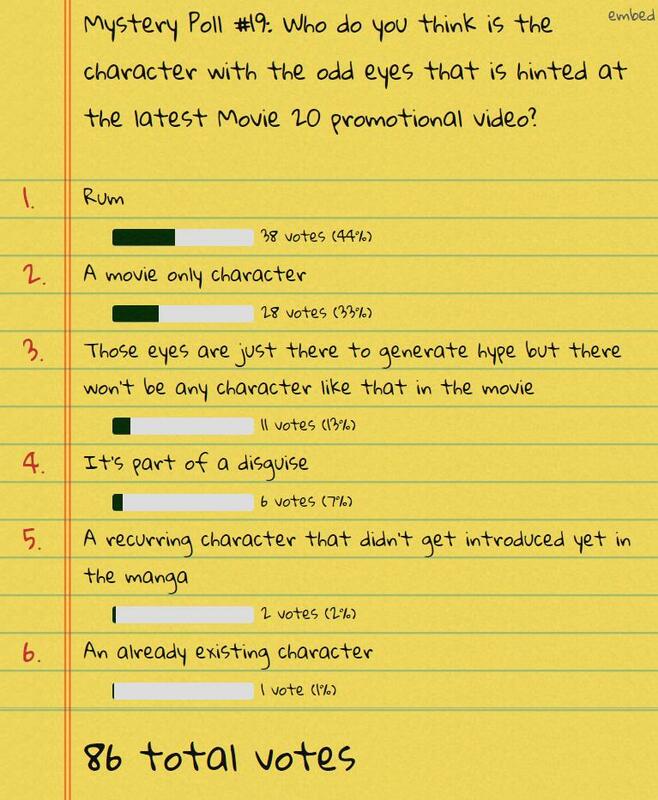 Who do you think is the character with the odd eyes that is hinted at the latest movie 20 promotional video? What do you will be the eventual situation in retrospective with Shuichi and Akemi dating? 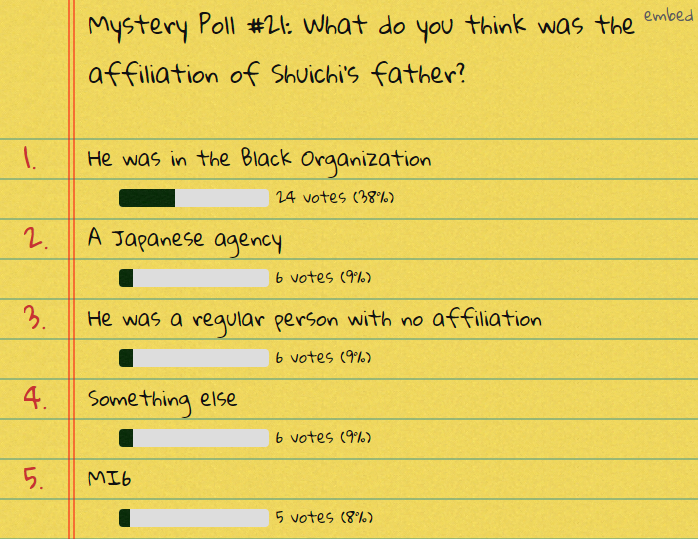 What do you think was the affiliation of Shuichi's father? 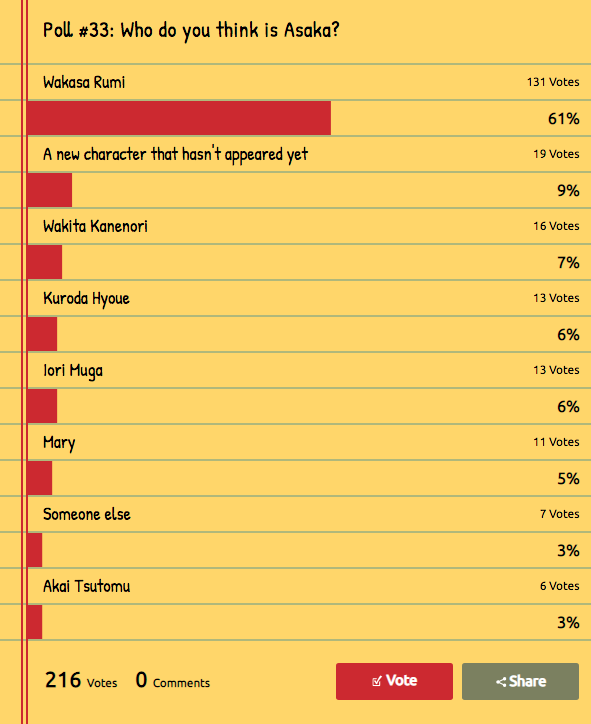 Who do you think is Wakasa Rumi? 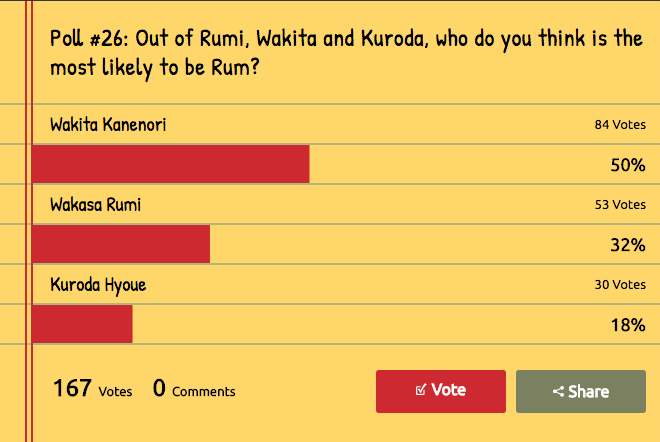 Out of Rumi, Wakita and Kuroda, who do you think is the most likely to be Rum? Do you think Momiji's butler is connected to the Rum plot? 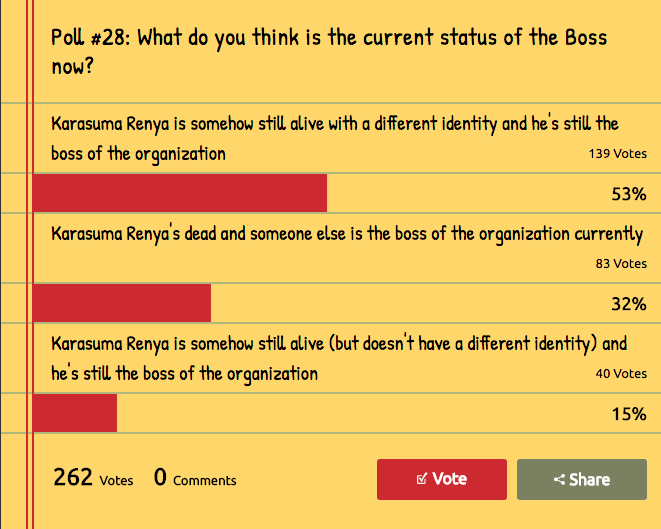 What do you think is the current status of the Boss now? When do you think chapter 1009 will be released? 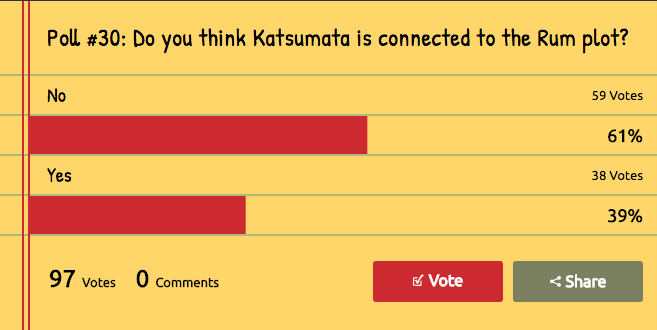 Poll 30: Do you think Katsumata is connected to the Rum plot? 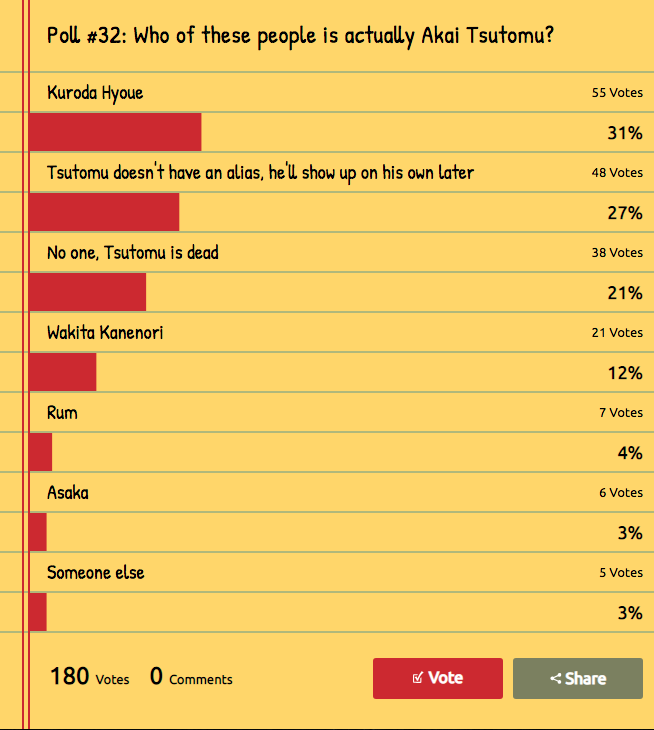 Poll 32: Who of these people is actually Akai Tsutomu? 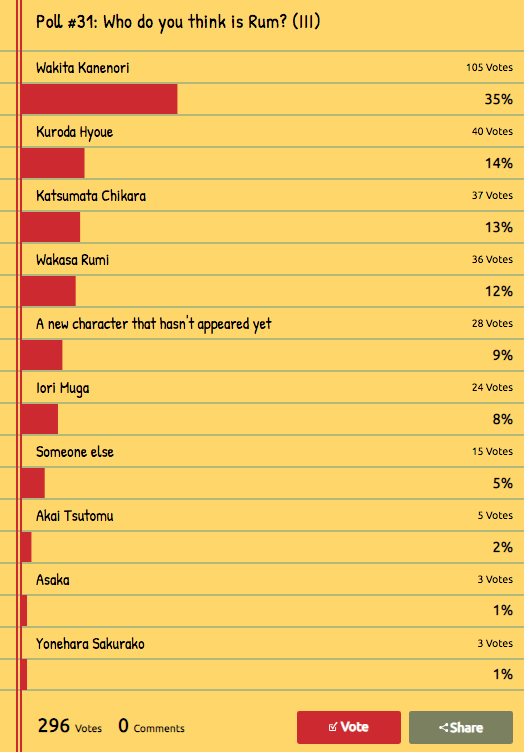 Poll 33: Who do you think is Asaka? 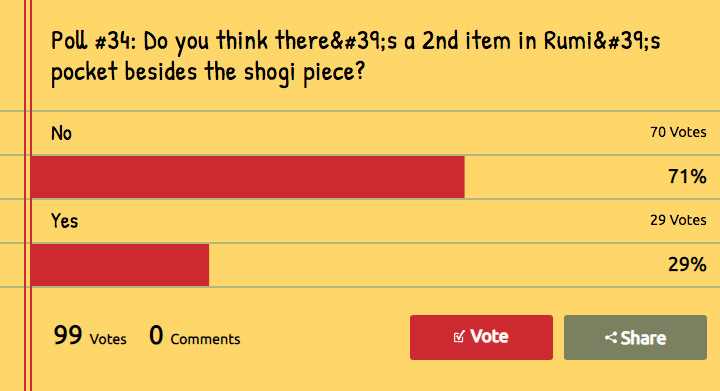 Poll 34: Do you think there's a 2nd item in Rumi's pocket besides the shogi piece? 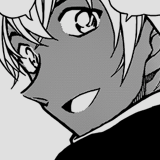 anyone and everyone feel free to disagree with me, but I am going to stick with this until there is something more to tie other characters, like Shuukichi, to them other than knowledge that they exist and smiling. Also voted for the 5th option (contact with Akai). While such solution may be meaningless overall, it's the one that makes the most sense to me. Plus, it'd be the best case scenario regarding this mystery. Shuukichi always seemed to me like a big red herring. I used to think he didn't exist and she was in contact with Akai, but something (can't remember right off what it was) suggested the second brother was real, so I'm going with Shuukichi for now. Last option. I think she's just in contact with someone who is in contact with Akai. I wonder if he could be a brother figure and he and Akai are just really close. It has to be Shuukichi... I remember when people were sure that it was Amuro now that I think about it. 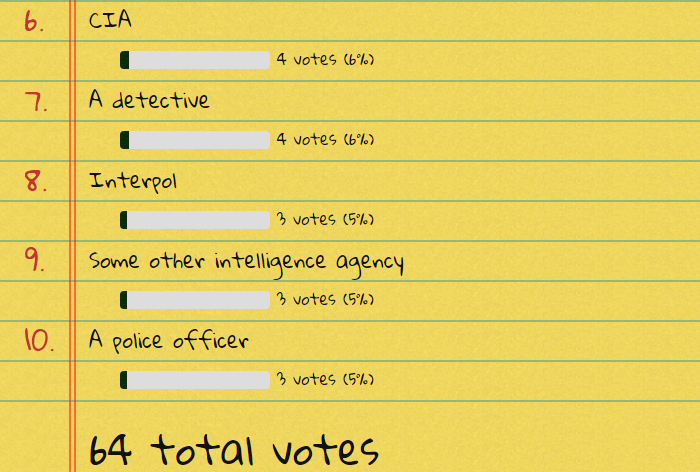 I voted for Shuukichi even though I have trouble believing this since it is too obvious. Aoyama-sensei always makes us fall for the obvious and then pull another unexpected reality. 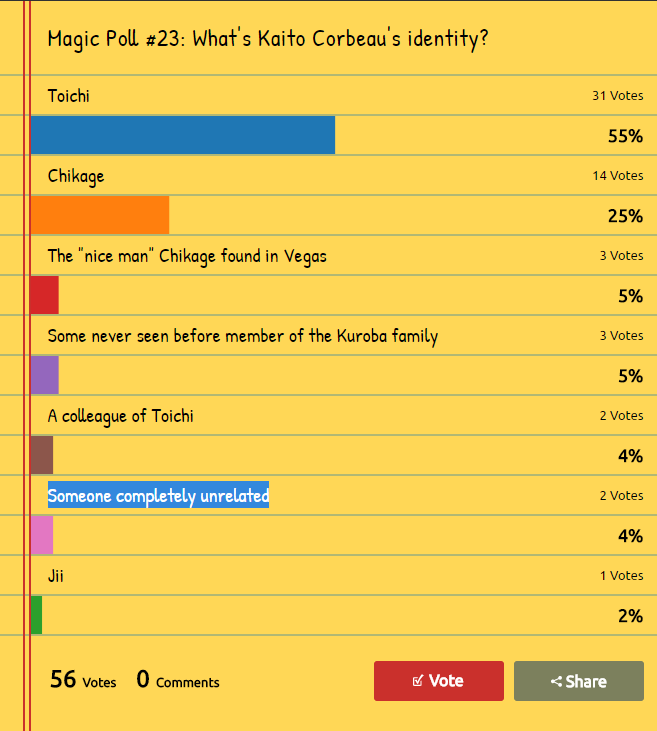 I voted Shuukichi because I did not see an evidence that supports the other choices, unless coming chapters will suggest otherwise. 1-She is in contact with Akai but does not know he is Akai... but what is the point? maybe Akai is posing as the second brother? For what reason? 3-She is in contact with Akai and knows he is Okiya.. Oh well, again I don't find it subtle. If she knows Okiya is Akai then what is the point of having a listening device during the Detectives' Nocturne case if Okiya is already listening to something (but again, I am not sure if they were listening to the same thing back then). One of the things that bother me is Conan's reaction to all of this. 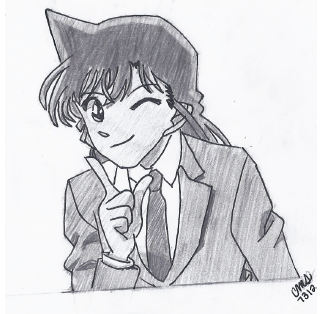 Back during the Mermaid/Kaito Kid's case, when Sera was talking about her older dead Shu-nii's hat, Conan's reaction was suspicion (File 830/Episode 725). Am I the only one who is wondering why? Oh and very subtle board!! The way I see it, maybe she is in contact with Akai and knows that he is alive, but for her, this is only recent knowledge. This would explain why she is never shown talking to any "brother" on the phone before Train case. On top of that, she doesn't know his current location or that he is in disguise. Someone had to have originally told her that Akai was dead, and because of that she would know not to mention who she was talking with. For that reason, in the Adultery case where she is very first shown contacting someone on the outside by phone, she does not say who she is talking with. The big error in Masumi's movements is that she was overheard by Eri when talking on the phone before the case, when she thought that there would be no one connected to her, Conan's group, or the case present to overhear things. It was only because Eri came by early that we even have information that indicates that she was talking to a "nii-san" (brother). When Conan asks about it later, he specifically asks about her talking to her "brother". Because Conan had knowledge that it was a "brother" she couldn't say otherwise without being suspicious. Because she couldn't deny that fact, she had to create a new brother, or pretend that she was talking to a living brother that we wouldn't have known about before now. I'm not saying that Shuukichi isn't related to the family (although I would like it if he wasn't), all I am saying is that I think that Akai is the person she is talking to on the phone. For example: one possible scenario, Shuukichi could be related to the family, Masumi could be talking to Akai on the phone, but then pretending that Akai is Shuukichi and attributing qualities of one brother on to the other when others ask about the "brother" she is talking to on the phone. She certainly couldn't say that she is talking to Akai, now could she? The Blush Mermaid: Sera asks about the hat Ran picked up. After this case, Sera doesn't concern herself with her dead brother appearing in front of her anymore. (which is pretty peculiar). Delivery Service: We see Okiya's phone very clearly. Yumi's Love Story: Red herring Shuukichi is introduced. Steamy Relations: We find out Sera talked on the phone with her brother. Suspect Makoto: Sera has more contact with her brother. Brother has the same phone as Okiya. Also she mentions the mid bro for the first time. Red Woman: Sera makes up more lies about her brotherly situation. Shogi Case: The return of Shuukichi red herring. 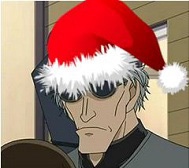 Okiya smiles and trolling. MG joins the trolling. Why do I say Shuukichi is a red herring? Because Gosho practically screams at us (especially in the last Shogi case) "Suspect him! Look, Okiya's smiling. Suspect him dammit!". It's in the same line of Okiya drinking Bourbon at the beginning of the Bourbon arc so we'd think Okiya's Bourbon. Later it was revealed Akai likes to drink Bourbon, so for all we know, it can be revealed later that Akai likes Shogi and MG is Shuukichi's biggest fan. Just because the two were maybe glad Shuukichi won doesn't mean they are related to him, and it could be just a giant misdirection on Gosho's part (he does it, you know). jimmy_kud0_tv2 wrote: The way I see it, maybe she is in contact with Akai and knows that he is alive, but for her, this is only recent knowledge. This would explain why she is never shown talking to any "brother" on the phone before Train case. On top of that, she doesn't know his current location or that he is in disguise. Someone had to have originally told her that Akai was dead, and because of that she would know not to mention who she was talking with. For that reason, in the Adultery case where she is very first shown contacting someone on the outside by phone, she does not say who she is talking with. I agree with your overall analysis, but I still have some concerns. Why would Akai do this? Akai hid his personality in order to not endanger the people around him (+ pursuit of BO). So why would he let Sera be in contact, ESPECIALLY after the Mystery Train thing? BO obviously know about Sera and now Bourbon is suspicious of Akai's survival. The possibility that BO will recheck Sera's reaction (and FBI Co) is still possible and I am sure Akai will take that into consideration. This is a question I have a problem answering. PS: the only way to solve this mystery is to go on and dig stuff from tangents, but I am trying to minimize them too. Again, I agree. I only chose Shuukichi because I still have a problem with Sera contacting Akai. I have concerns about Shuukichi being the second brother. My biggest concern is that he only met Conan once (supposedly, unless they know each other from the past?). I don't think this meeting is enough for him to go around and judge his intelligence. SilverBullet-sama wrote: I agree with your overall analysis, but I still have some concerns. Why would Akai do this? Akai hid his personality in order to not endanger the people around him (+ pursuit of BO). Sera saw her dead brother appearing in front of her on the train. I assume Akai wanted to clear things up so she won't search for that persona (scar Akai) and won't look into it. Not telling her would be cruel and dangerous. So why would he let Sera be in contact, ESPECIALLY after the Mystery Train thing? BO obviously know about Sera and now Bourbon is suspicious of Akai's survival. The possibility that BO will recheck Sera's reaction (and FBI Co) is still possible and I am sure Akai will take that into consideration. Why recheck any of those parties? Sera was in disbelief and said she thought her brother was dead, so why recheck her? Moreover, all it takes for Akai is to just tell Sera "I'm alive and hiding, don't tell anyone. If you see me, it's probably someone in disguise" and then keep in contact with her. I had always thought something was wrong with the Shuukichi theory, that guy just seemed too care-free.Also, the Red Woman case makes things even more suspicious, let's say you meet your friend's sister after a long time, your friend is now a famous Shogi player, do you think they would not ask Sera or Atleast make a comment on that?This thread has made me even more sure, but the odds still seem to be with there being a 3rd sibling, just not Akai.I'll be reading all related cases before I form a concrete opinion on this. I said Okiya because i still hope he himself is a charater. Not just Akai in disguise. I believe Sera and Okiya's first meeting ha s not been cleared up. As to why they reacted weired to eachother in the bathroom. Aslo his will work as Shukkich being a red herring pretty well. Probably related to Kir. And i tjink Okiya is a cool character compared to AKia and is smarter i think. 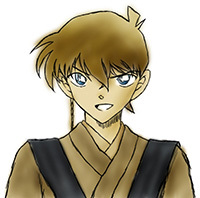 I would not like Gosho to just lose that character. I think him and Sera met up and spoke about Akai being undercover hench why she is now silent about her brother being dead. This could had possibly happened on the Mystery Train story. When he carried her to that room. 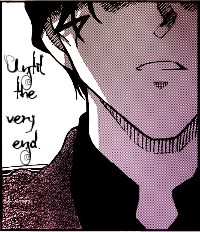 He does not look like Shuichi Akai or Masumi Sera, who presumably resemble their mother. The middle brother looks more like their father. The middle brother is older than Masumi, but younger than Shuichi. Neither of their ages have been revealed, but Masumi attends class with Ran and Shinichi who are 16-17, and Subaru Okiya claims to be 27. The brother's former high school classmates are currently 28 and 29 years old, suggesting that the brother is probably similarly aged. Although if that were the case, then Akai would be older than 27. He is apparently in the middle of an important job and won't tell Masumi where he is. He is very intelligent; note that Sera characterizes the already intelligent Akai as "strong" in contrast to the middle brother. He advises Masumi on cases via cellphone. He was able to correctly deduce over the phone that Masumi's deduction was unreliable in a bathroom murder case. While the middle brother is not a detective himself, his intelligence seems to be well-known among the students from his high school, as he apparently has solved some mysteries in his class during his time studying there. In one panel, we see the middle brother responding to Masumi's message using his right hand and a black cellphone. Unless the brother is disguised, this would imply he has light skin. The use of the phone with the right hand is not an absolute indicator of handedness because sometimes characters with known handedness will use phones with their off hands. The middle brother recognizes Conan and knows he is a good detective. After an exchange of information regarding deductions, the brother asked Masumi who she was referring to. 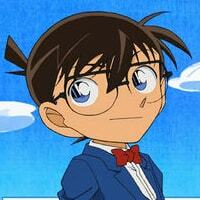 Masumi shows the brother Conan's picture thinking he will be surprised. The brother replies back that "if it's him, then there's no problem". Masumi is very surprised and wonders how her brother knows Conan. Her suspicion makes sense because Conan didn't exist prior to Shinichi shrinking. The brother later sends another text to Masumi, which makes Masumi react "Ah, I see. So that's how it is." According to Masumi, the middle brother's surname had been "Sera", which he got from his mother's side, until he graduated from high school. His current surname in the present timeline is presumably something else. I go with Shuukichi being the middle brother, he just seems to fit the list of things we know about the middle brother from DCW the best. I agree with your reasoning, but I still voted for Shukichi being the middle brother—like I believed Subaru=Shuichi over Subaru=Bourbon, I believe Shukichi=Middle Brother over Shukichi=Shogi player who happens to be liked by Subaru/Shuichi and REALLY liked by the Mystery Girl. Again, you could very well be right—the last couple panels at the end of the Shogi case could've been a big troll by Gosho (too obvious to be true)—and I wouldn't mind that, but I also wouldn't mind Shukichi being the middle brother (too obvious not to be true). Also, has anyone compared Subaru's/Shuichi's phone in File 898 to Middle Brother's phone in File 860?